I have recently, and for no apparent reason, become interested in aliens. I decided to start my investigation by reading Alien Agenda by Jim Marrs. Although the book is chock full of convincing research and real facts, it also relies heavily on circumstantial evidence. It is a book for open-minded people; those who think the world is far greater and more mysterious than we will ever understand. Many of the chapters go into explicit detail regarding government cover ups of alien activity. If this is your cup of tea, this book will give you plenty of evidence. The more intriguing chapters for me were those dealing with alien contact. Marrs starts the book by going back in history and explaining that UFOs are described in the Bible, most notably when “Ezekiel saw the wheel”, as well as in the myths of the Hindus. Christopher Columbus reported seeing strange lights in the ocean that rose out of the water and sped away across the sky. Marrs also investigates instances of alien contact, crop circles and unexplained animal mutilations. He writes about a psychic process developed by the military called Remote Viewing, describing how it was initially used to spy on the Soviets. This process involves psychic people being given a longitude and latitude and then “remotely viewing” what is located at that place. This process has enabled the viewers to see all types of alien activity, both in the confines of the US government as well as in space. They can even see the surface of other planets, which made for an interesting read. The descriptions of Jupiter and Venus are beautiful and fascinating. More importantly, what the viewers saw in the 1970’s was later corroborated by scientific data. Perhaps the most mind-blowing chapter of the book involved the moon, and how its rocks are 3 billion years older than any found on earth. 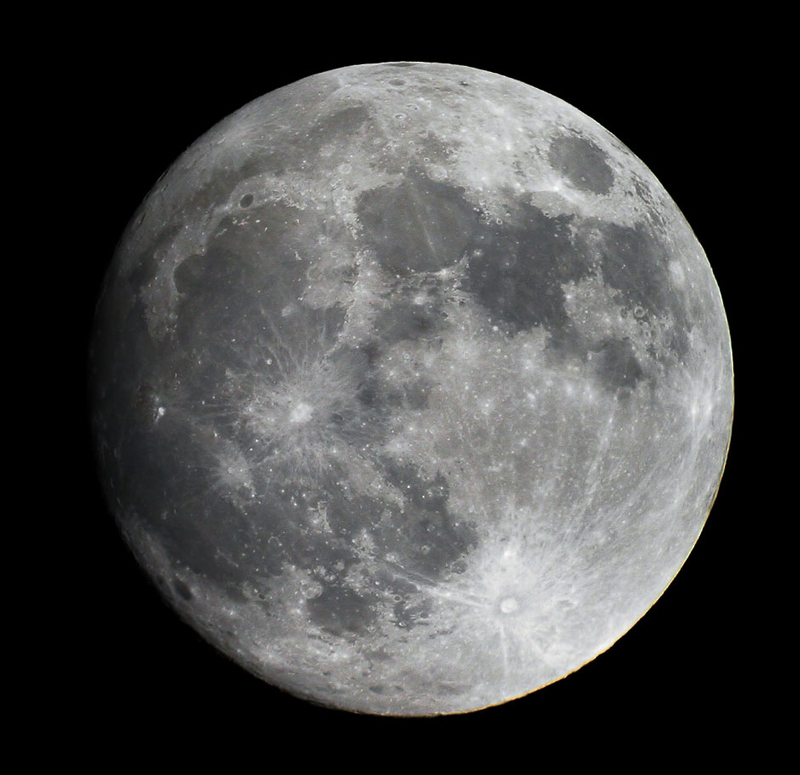 Most people think the moon was created at the same time as the earth, but the evidence suggests otherwise. As opposed to the earth and all other planets, the surface is covered with a hard layer of molten rock, with a soft layer underneath. This suggests that at one time the moon was hollowed out, thus dumping the hard interior on top of the soft exterior. When astronauts left the moon, they dropped a large object onto it to gather seismic data. To their surprise, the moon rang for hours like a bell, denoting that it was hollow. This evidence as well as the strange facts about the orbit of the moon, suggest that it was hollowed out and used as a spacecraft. The aliens carefully brought it into our orbit, and many astronauts have reported seeing alien activity on the moon. Moreover, there are many mysterious structures on the moon that resemble bridges. They are composed of rectangular and obelisk shapes, which are not found in nature. These structures are enormous, measuring miles high and wide. I would highly recommend this book to anyone interested in alien activity. Marrs gives several reasons for the Aliens continual interest in humans, but I don’t want to ruin the surprise. Keep an open mind, and this book might make you think differently about the Universe and our place in it. I am convinced now more than ever that aliens are real. The sea, the land, the artist has with great sadness known they too will be no more. When Bas Jan Ader disappeared at sea in 1975, a relatively small number of works were left to account for his five year career as an artist. This modest oeuvre—consisting of short films, photographs and slides—attests to an artistic perspective that was at once fragmentary and remarkably resolved. In these documents, Ader staged momentary glimpses of a subjectivity threatened by failure and dissolution, a plight he repeatedly played out in the act of falling. For Baudelaire, laughter is an ambivalent response to failure, marked by unconscious feelings of superiority. He draws a distinction, however, between a commonplace amusement at the misfortunes of others and what he terms the “absolute comic,” a more sophisticated humor that recognizes the debased state of humankind at the hands of nature—a Fall of the theological order. The subject who has tripped and is falling is losing the self-possession of consciousness- becoming an object among a universe of indifferent objects. To laugh while falling is not merely to imagine oneself from the position of another spectator, another subjective state, but to recognize the smug folly of any subjective state as it stands against the forces of nature. In an early installation, Light Vulnerable Objects Threatened by Eight Cement Bricks, 1970, Ader strategically positioned on the gallery floor an assortment of everyday objects that included light bulbs, flowers, a birthday cake, eggs, and a painted portrait. these items lay defenseless beneath cement bricks that dangles from the ceiling by thin lines of rope. During the course of the exhibition, Ader severed the ropes with a utility knife and allowed the bricks to fall; thus unleashing the destructive potential of gravity upon objects, which seem to embody the frailty of human existence. Similarly, Nightfall, 1971, demonstrates the vulnerability of two tangles of glowing light bulbs. This short film presents Ader in his garage as he arduously hoists a large brick over his head, then allows it to fall, demolishing one pile of lights. Tension builds as he again lifts the brick, then suddenly lets it fall on the second group of lights, thereby extinguishing the illumination for the camera and bringing the film to an abrupt conclusion. As with many of Ader’s films, the action ends at the moment of impact- suggesting irrevocable consequences. If these pieces employ objects as surrogate subjects, then Ader’s other falls dramatize a contrary movement, that is, the human subject becoming an object under the sway of natural forces. Most often it is Ader’s own slender frame that plummets earthward. It is this moment, Ader the artist losing self- possession and becoming a passive objects, that is reenacted in a series of locations and circumstances-an event whose reiteration suggests that it provides no resolution. I do not make body sculpture, body art or body works. When I fall off the roof of my house, or into a canal, it was because gravity made itself master over me. Here Ader challenges the body as the sole referent of his work that is the body as merely an aesthetized object. As a Dutch immigrant to Southern California in 1963, Ader was schooled in the dominant American movements of Minimalism and Conceptualism. this era represented a marked shift in art making toward the empirical and analytical in response to a culture that was experiencing a massive, rational reordering of the social. For the most part, the practitioners of Minimalism made the material factuality of the object and the body’s perceptive response the primary content of their work-such that most subjective concerns were excluded from discussion. Likewise, many Conceptual artists embraced a quasi-scientific approach in examining the relationship between consciousness and matter, literary tropes such as metaphor, allegory, irony and their corresponding narratives of the self, were largely ignored. Ader distanced himself from “body art”, perhaps because he saw the prevailing artistic practices deliberately omitting issues of subjectivity. He needed to draw a distinction between representations in which the body is an object denied interiority and his images of the body becoming an object by losing interiority. Ader consistently stages a tension between the body, consciousness and natural forces. He does so, however, with an awareness of how the natural is perpetually invented by subjective systems of meaning. This is most evident in the work Untitled (The Elements), 1971. Originally planned as a film and a series of photographs, only a singel photograph was completed. The image finds Ader standing on a rocky coastline, dwarfed by the turbulent ocean at his back. He holds a cue card on which the word “fire” is handwritten (negatives from this session show “earth”, “air”, and “water in other cards). This work slyly mocks any system of belief that portends to circumscribe, within its linguistic categories, an immense disorderly universe. Similar concerns animate 473 Reader’s Digested, 1970, an early installation created in Ader’s garage. The artist constructed a compost heap of earth, grass and copies of the middle-class American journal Reader’s Digest. A version of the natural is being grown upon the linguistic sentiments of the popular imagination. If these works are in keeping with a Conceptual practice that explored the mechanisms of representation in attempting to map the territory of the real, then Ader complicated this exploration with the addition of his own subjective presence. Ader adopted some of the formal conventions of this practice in which the art object is treated as a mere artifact. Nearly all of the artist’s work exists in several forms of documentation from which he made appropriate selections for exhibition. The deliberately staged quality of his recorded performances hints that Ader saw himself as an actor in a fictional production. For an artist like Chris Burden, the authenticity of the original event- for example, the artist shot in the arm-is maintained through a nearly scientific handling of artistic evidence. Ader, in contrast, frequently undermines the integrity of a particular performance by repeating it several times. The most striking example is the series I’m Too Sad to Tell You, a postcard, photographs and two films documenting the artist weeping. THis piece was staged on two occasions (1970, 1971), suggesting that the artistic concerns transcended the specifics of any single moment. Thus Ader makes the referent of his work not the art object or a specific temporal occurrence, but the fictions of “The Artist”. As inheritor of this heroic legacy, Ader became the vessel of romantic subjectivity that was fated, within the changes of an emerging late-capitalist culture, to disappearance. In some of his earliest works, Ader’s concern with the artistic persona as a self-conscious fiction is clearly pronounced. A black and white photograph titled The Artist as Consumer of Extreme Comfort, circa 1968, presents Ader reclining by a fire, sipping wine, with a book on his lap and a relaxed, pensive expression on his face. Another work, which was used as a poster for his 1967 MFA thesis exhibition, The Artist Contemplating the Forces of Nature, shows Ader sitting in a wicker chair atop the roof of his house, smugly smoking a cigar. Three years later, from this same vantage point, he would begin the action for Fall l, Los Angeles, 1970, in which he tumbles down and off the roof. Ader cast himself as “The Artist”, however it is a role with such grandiose expectations, that the individual must fall perilously short. In contrast to his later work, his early pieces offer parodic visual representations of subjective composure. The Artist in the act of “contemplating” stands in marked contrast to the embodied artist in a dangerous descent. However, both represent violence to a coherent sense of identity. By adopting the persona of The Artist, Ader must produce a self within the dominant fictions of that role, and as such an inauthentic double. This false addition is to some degree a willing loss of “actual self”, paralleling the threat to subjective integrity dramatized in the falls. This twofold movement of self-invention/self-destruction is a consistent pattern in Ader’s work. An entry from Ader’s notebook illustrates his degree of self-awareness in this process. Write an articles regarding van Gogh’s genius and pre-eminence as modernist through the price of the cutting off of an ear (public always recognised implicitly his real achievement as an artist was this act). Ader’s direct inheritance of the European tradition of romantic irony (pace Baudelaire) allowed him to explore a set of concerns somewhat distinct from his American counterparts. In this literary tradition, the subject is isolated within the territory of its own unhappy consciousness. Excessive self-reflection produces the perspective that all knowledge can only be registered within the unobjective limitations of subjectivity. Thus a sort of death-in-life prevails in which any version of the self is viewed as arbitrary and inauthentic. Irony offers a provisional respite from the melancholy circularity. The self produces a double that is decidedly fictional and therefore distanced from desire for authenticity. However, this ironic stance provides no resolution. It must remain vigilantly self –conscious or else lapse into lesser stages of falseness. This brand of irony, though forged in anguish and dissatisfaction, occasionally produces a comic effect. In a series of works directly addressing modern Dutch master Piet Mondrian, Ader’s performances approach slapstick. Staged in his native Netherlands, Ader filmed and photographed a brick road leading to the lighthouse in Westkapelle, a frequent subject of Mondrian’s early paintings. In one photograph Pitfall on the Way to a Ne0-Plasticism, Westkapelle, Holland, 1971, Ader, dressed entirely in black, is seen losing his footing an spilling the items that he is carrying; a plastic yellow paint can, a blue blanket and a red satchel. Mondrian’s ideals of harmony and order are deliberately botched in the hands of Ader who, in an effort to turn himself into the inert composition of a painting, has instead become a debased falling object. In a discussion of Beaudelaire, Georges Bataille describes poetry as the failed relationship of the subject to the world. For Bataille, the poetic process is based on an endlessly futile attempt at subject/object unification-his words, a desire for “the impossible”. As one of the central themes of romantic thought, the subject, through concrete observation, approaches a harmonious relationship with nature and self. However, this transformation always takes place at the level of language which substitutes and annihilates the natural object. The flux and fluidity of existence is unbearable as such, and the poetic subject wishes t transfix an externalize consciousness to the immutable status of an object. Like Beaudelaire, Ader tempered this melancholy desire for the impossible with an ironic consideration of the means of representation. In the works titled I’m Too Sad to Tell You, Ader pushes the disparity between an unhappy consciousness and its representation to a dramatic climax. In the first version of this film (1970, no longer extant) Ader’s upper torso and face are tightly framed by the camera. He drinks froma cup of tea, produces a genuinely grieved expression and cries. A photograph from this session was reproduced in the form of a postcard. A handwritten note. “I’m too sad to tell you,” was added to the reverse side and copies were mailed to friends and colleagues in the art world. The title directly states what cannot be stated, that is, his experience of despair is simply beyond words. In questioning the suitability of language to consciousness, Ader also calls into attention the body’s signs. Tears, as the body’s ultimate expression of grief, are perhaps as reductively uncommunicative as words. Ader’s choice of format is telling. In his inability to give an appropriate voice to his heartache, he instead produces a souvenir of that experience. The mass-produced form of the postcard is congruent with an artistic self that is mired in the failures of its own fictional status. This turn toward kitsch also speaks to the loss of a sense of authenticity to the pervasive sentimentality of American culture. Ader’s use of popular imagery, e.g. the fifties song Searchin’ by the Coasters and selections from Reader’s Digest, though sparing compared to the Pop artists, is a subtle acknowledgment of the effacement of certain subjectivities in a culture governed by commodities and the mass media. It seemed to be Ader’s futile desire to represent genuine emotions within the empty tropes of melodrama. For Ader, a Dutch artist living in Los Angeles, the possibility of the European romantic tradition with its focus on the individual was perhaps threatening to dissolve within the horizon of a new culture. Southern California as a territory of technological utility and order-producing subjectivity thoroughly in concert with the mobility of images and goods- was increasingly antithetical to aspects of the European literary heritage. In Farewell to Faraway Friends, 1971, Ader’s figure stands watching a fiery sunset against the sea. This image of loss echoes equally the romantic landscapes of Caspar David Friedrich and the kitsch scenic shots featured on insurance calendars. When Ader evoked the characteristic melancholy and nostalgia of the romantic tradition, it is likely that he was in part mournful for the tradition itself and that he saw himself as a witness to its disappearance. Present in his final work, In Search of the Miraculous, 1975, are Ader’s enduring concerns as to the self’s fictions and failures. Perhaps the desire to transcend such self-negating ironies reached an intolerable level. In its conception, a solo voyage across the Atlantic Ocean would be so consuming in its demands and duration that all unresolved issues of identity could be subsumed. The artist could finally become an object at the play and mercy of nature’s forces-in extended freefall on the ocean’s currents. In Search of the Miraculous was intended to be a trilogy. The first part took place at the Claire Copley Gallery in Los Angeles-where a small choir with piano accompaniment crooned a series of mournful sea shanties. A bulletin by Art $ Project (no. 89. 1975) published in conjunction with the exhibition featured lyrics and an image of Ader aboard hi 12 foot, 6 inch sailboat that he christened “Ocean Wave”. 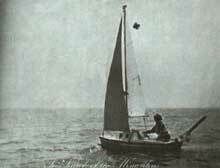 The second part of the trilogy was to be Ader’s voyage from Cape Cod, Massachusetts to Falmouth, England, which he expected to take 67 days. The third and final part, an exhibition at the Groninger Museum in Holland, would duplicate the show at the Claire Copley Gallery and feature documentation from his journey. Ader set sail on July 9, 1975, on a voyage that, at the time, had yet to be accomplished in such a small craft. Radio contact was lost after three weeks and there were no further signs of Ader until the empty hull of his boat was discovered off the coast of Ireland the following April. Perhaps the Miraculous event was the abandoning of self in all its fictions to the demands of the voyage-a relief from the spiral of ironic descent, a forced congruence of body and consciousness, a movement homeward. It was Ader’s misfortune and ours that his search for the impossible took place on the perilous edge of self -dissolution.